Over decades of carefully designed kinetic experiments and the development of complementary theory, a more or less complete picture of the mechanisms that govern emulsion polymerization systems has been established. This required means of determining the rate coefficients for the individual processes as functions of controllable variables such as initiator concentration and particle size, means of interpreting the data with a minimum of model-based assumptions, and the need to perform experiments that had the potential to actually refute a given mechanistic hypothesis. Significant advances have been made within the area of understanding interfacial processes such as radical entry and exit into and out of an emulsion polymerization particle, for electrostatic, steric and electrosteric stabilizers (the latter two being poorly understood until recently). The mechanism for radical exit is chain transfer to monomer within the particle interior to form a monomeric radical which can either diffuse into the water phase or propagate to form a more hydrophobic species which cannot exit. Entry is through aqueous-phase propagation of a radical derived directly from initiator, until a critical degree of polymerization z is reached; the value of z is such that the z-meric species is sufficiently surface active so that its only fate is to enter, whereas smaller aqueous-phase radical species can either be terminated in the aqueous phase or undergo further propagation. For both entry and exit, in the presence of (electro)steric stabilizers, two additional events are significant: transfer involving a labile hydrogen atom within the stabilizing layer to form a mid-chain radical which is slow to propagate and quick to terminate, and which may also undergo β-scission to form a water-soluble species. Proper consideration of the fates of the various aqueous-phase radicals is essential for understanding the overall kinetic behaviour. Intra-particle termination is explained in terms of diffusion-controlled chain-length-dependent events. A knowledge of the events controlling entry and exit, including the recent discoveries of the additional mechanisms operating with (electro)steric stabilizers, provides an extension to the micellar and homogeneous nucleation models which enables particle number to be predicted with acceptable reliability, and also quantifies the amount of secondary nucleation occurring during seeded growth. 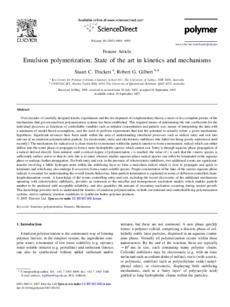 This knowledge provides tools to understand the kinetics of emulsion polymerization, in both conventional and controlled/living polymerization systems, and to optimize reaction conditions to synthesize better polymer products.